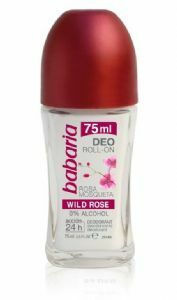 Nurture and protect your delicate underarm area with Babaria’s gentle Rosehip Oil 24 hr roll on deodorant. Because this deodorant has no alcohol its ideal for sensitive skin so can be used by all the family. The Rosehip Oil soothes and moisturises the skin while the chlorohydrate helps prevent perspiration. It gives effective protection for up to 24 hours. This deodorant once dry does not leave white marks or stain clothing. It has a delicate clean fresh fragrance so as not to detract from your usual perfume or aftershave. • Contains Rosehip Oil to help keep your skin moisturised. Aqua, Aluminium Chlorate, Steareth-2, Isohexadecane, PPG-15 Stearyl Ether, Rosa Moschata Seed Oil (3% Aceite Rosehip Oil), Tocopheryl Acetate, Steareth-21, Parfum, (Fragrance), Phenoxyethanol, Farnesol, Dehydroacetic Acid, Benzoice Acid, Sorbic Acid.